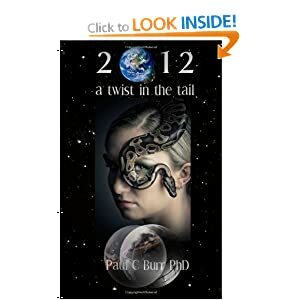 Available from Amazon in US, UK and worldwide. Paperback now available from Amazon US , UK and Createspace. Kindle version available from Amazon US, UK and other regions. epub/ipad/iphone and further e-versions available from Smashwords. If you listen, relationships tell you everything that is ‘incomplete’ within you. Your actions, thoughts and deeds (what you put out to the universe) return to you amplified, be they of love or not-love. For example, if you project fear, you will attract things to be fearful of. If you project compliance, you will attract things which require your compliance. Neither fear nor compliance are love. These negative emotions inform you of something that is incomplete within you, i.e. something that is not your true nature. To unearth these oft-hidden incompletions, in the world of light and shadows within, you ‘dig’ (The ancients used the word ‘dig’ synonymously with ‘think’.) below the horizon (sunset) of your consciousness. The ancient Egyptians deified the god, Set, to help you ‘dig’. Set etymologically became Satan (and the Roman god, Saturn, the most distant planet, visible to the naked eye, from the Sun), demonised as the harbinger of evil (de – evil,), the devil. We even name a day of the week after him, ‘Satur(ns)day’. Set was charged by Ra (the sun god) to repel the serpent, Apepe (ego), an allegory of darkness and chaos. The darkness and chaos caused by the negative karma, invoked by incompleteness. Set can thus be treated as a demon or as a harbinger of wisdom; either a devil who entraps you in his evil ways or an all(egor)y who presents you with a reflection, in the outer world, of the chaos and darkness that still lurks in your inner world – you choose. When you figure out a way to release all incompletions (forms of not-love), all that remains is love. Part I, For The Love of Lilith, describes the journey, shared by two people, to embrace the love of Lilith (or Lilithian Love) – that pure androgenous spirit of love, light and wise connection to all that is – along with the sensibility and freedom to apply that wisdom. 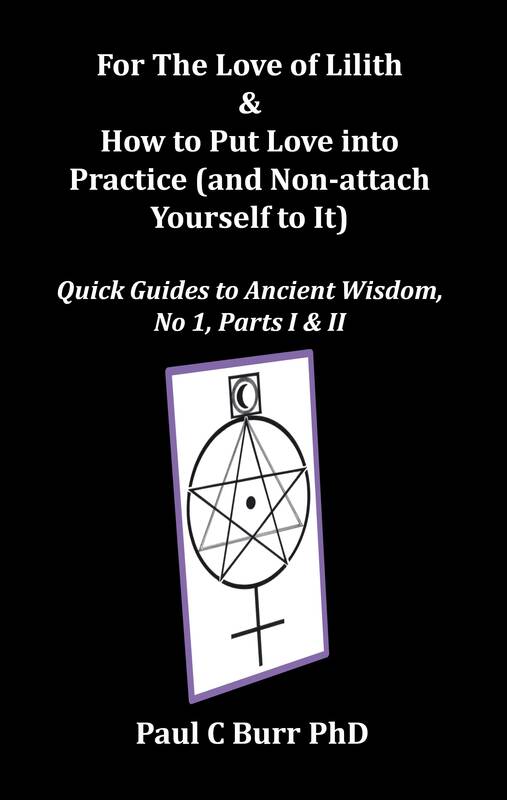 Part II, How to Put Love into Practice (and Non-attach Yourself to It), contains exercises to put love into practice – and – project (and non-attach yourself from) what your heart truly desires that you do not have. “I have known Paul for years and he walks his talk! He has the deep understanding of the shadow side of the female, knowing of the fear, shame, anger and sadness of being abandoned and how to turn this feelings into light and love. 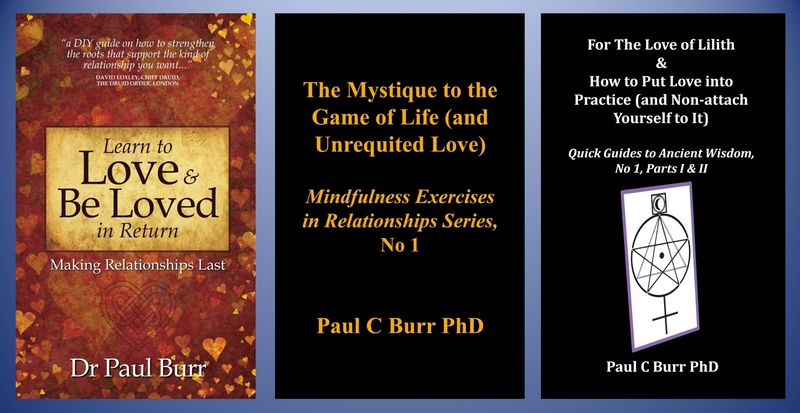 e-versions of The Mystique to the Game of Life (and Unrequited Love) now available from Smashwords, paperback and kindle versions from Amazon US, UK and worldwide. There is a mystique to life, a mindfulness, practiced in Ancient Egypt and nowadays, as an emergent science by psychotherapists. And to apply the mystique, you need to be mindful of the purpose and rules of the game, of life, and of love. (Mystique – mystery, power, aura (awe-Ra) that surrounds something or someone) Who first taught you the mystery of love? In order to discover love, you need to know what not-love (fear) is. The ‘wet and dry’ of life: as you journey towards love, you can’t avoid approaching not-love at the same time. The same goes for wealth, joy, health or any goal you set yourself. Your head judges, your loins desire sexual fulfilment and your heart seeks to share love. I call this the Head, Heart and Loins dynamics of a relationship. When all three are aligned, within and between partners, their relationship is probably in good shape to meet the outcomes they seek. (The same holds true for a personal friendship whether there is a sexual element to that friendship or not.) I speak neither of good nor bad, nor moralise. I speak of the process of achieving a higher purpose, you set for yourself, through the journey to the goals you set for the relationship, be those goals profound or for short term recreation. Your higher purpose is not the goals you set, it is the journey you complete to become your true nature, the journey to love, self-love, oneness, completeness. Your journey to self-love involves the removal of all anger, hurt, shame and fear about the past and future. It implies living mindfully in the present moment (by moment), the present tense. A loving relationship with that someone special in your life can delight and traumatise your emotions. This booklet contains a series of exercises to take you on a mindful journey, read its route map and practise ancient wisdom. The nature of outcomes (or goals) you and your partner (or friend) set for yourselves. The difference between your purpose and goals for a relationship – and they are very different, in context and value. How when your emotions are tested to the limit, the path to success requires that you stay mindful of your purpose and let go of the outcomes you seek, moment by moment – mindfulness. Mindfulness, sometimes referred to as being present in the moment, is the process of creating love, enthusiasm, compassion, patience and completeness in the moment (by moment) – regardless of whether these vibrations are returned or not. It takes mindfulness to fulfill a relationship’s true purpose, which curiously can be achieved whether the goals are achieved or not. Mindfulness is the vehicle by which to travel the journey. Learn to Love and Be Loved in Return, goes way beyond the Laws of Attraction. It reveals how to attract a prize far more important than any external ‘trophy’, we might set our hearts on. Love brings the most joy and causes the most stress in our lives. Learn to Love and Be Loved in Return guides people how to enter into a relationship and make it last. 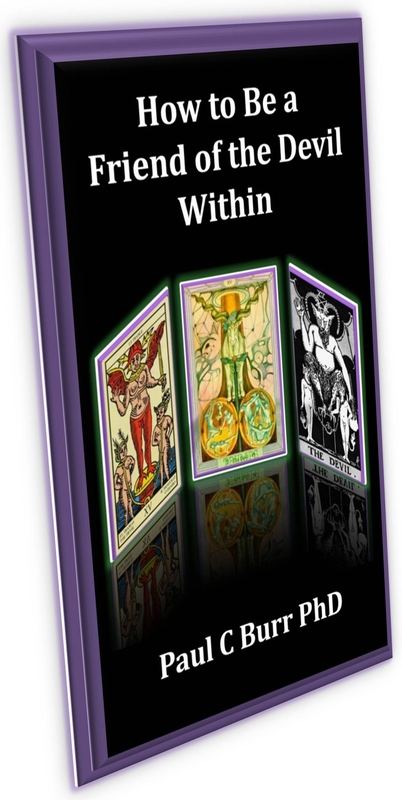 It provides new and profound insight into the physical, emotional and spiritual aspects of relationships. It discerns love from its disguises (not-love). The reader finds out what needs to happen, beyond love, for two people to come together and stay together in a relationship that flourishes. The book is filled with self coaching tips and easy-to-follow steps; a how-to guide that helps the reader go for what they set out to achieve in love and in life. Learn to Love and Be Loved in Return unfurls four critical questions, the answers to which determine whether two people start a relationship. For two people to go on and succeed in a relationship, ‘Purpose’ and other factors come into play. The book constructs three ‘pillars’ by which a relationship stands or falls. The ‘pillars’ are built on a ‘bedrock’ that once broken, the relationship has nothing left to stand on. But something else, something far more profound, connects the ethers in and between the ‘pillars’ and their ‘bedrock’. This fundamental ingredient cannot be destroyed but it can be improved. It is ever-present in a relationship, throughout all its stages of development. Readers discover how a relationship spirals upwards through 7 stages (at least once, if not several times) to achieve its fullest purpose. Most couples do not get past Stage 4. At Stage 4 each partner finds the spiritual reason they are together. They see a reflection of themselves in one another. This leads us to realize that the summation of the relationships we attract in life, mirror the relationship we have with ourselves. The book culminates in 7 self-coaching steps to move people or couples on in their journey, to live the lives and achieve the purpose they were born to achieve, through improved relationships. 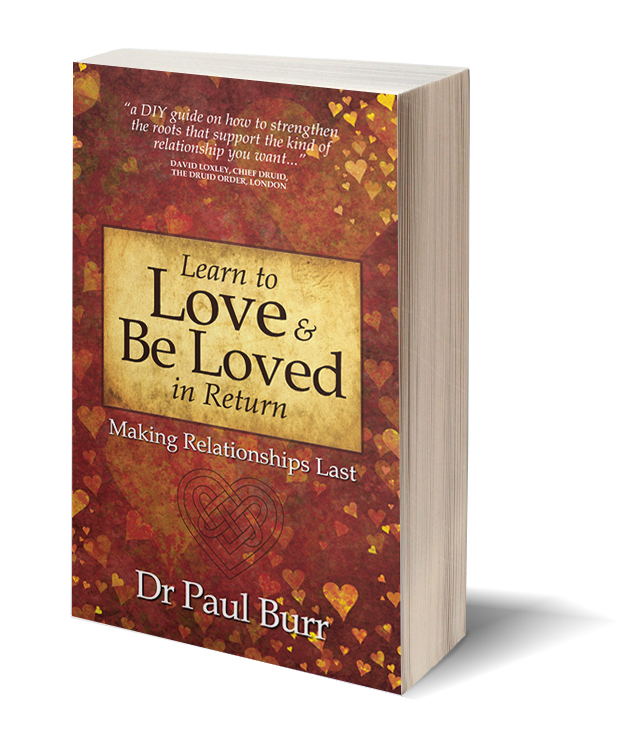 Learn to Love and Be Loved in Return is founded upon author, Paul Burr’s, 13 years of coaching experience. A business coach who found himself working extensively with people’s personal lives and detailed histories, to help them make the breakthroughs they seek. 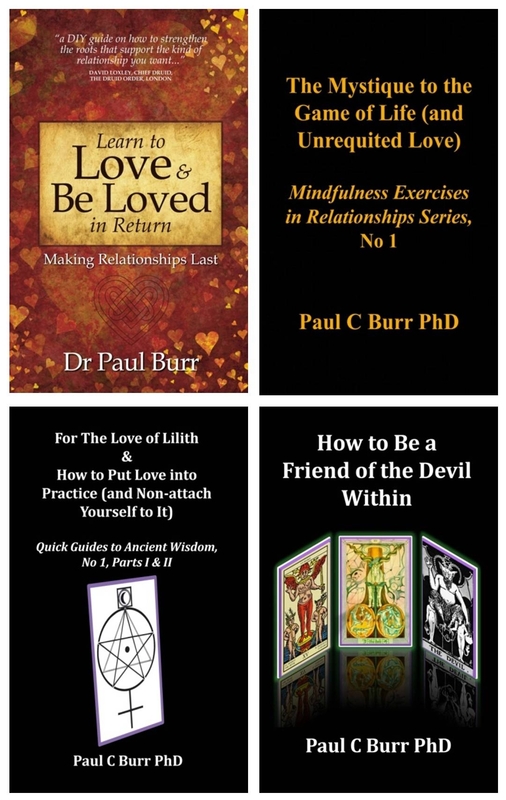 Paul was encouraged by Romilla Ready, Lead Author, Neuro-linguistic Programming for Dummies® to write the book. He was mentored by David Loxley, Chief Druid, The Druid Order, London and quotes David’s knowledge of druidic wisdom throughout the book. This book will help you to get the relationships you want by making you aware of the baggage that holds you in a place where you ‘know’ things should be different but you can’t break out. But… be warned this book, as with all other self help tools, is a waste of money!!! Unless, of course, you not only read ALL of it and digest it but most importantly, do the exercises. It has been fascinating to watch Paul, in his inimitable style, testing the concepts in this book by living through a fairly traumatic year and seeing him come out the other side, changed, a better human being who has learnt to be compassionate not just with other people but also with himself. At times, Paul would say he couldn’t write but it was only because he hadn’t learnt how to solve a problem with a relationship with which he was wrestling. So this book really is rooted in actual, real life experience and will help you short cut your learning curve, if you allow. …this book has been a pleasure to edit. Most of the time, books on NLP are about the law of attraction and so on. I love the fact that this book goes beyond that. The content is fascinating and interesting. I learnt much from what was shared. About time I faced up to and broke my relationship patterns. yep, here goes….! This book falls into a gap between too simple and too difficult to understand. If it were either, it would fail in its mission. Paul has put all of his experiences together and created something unique. This book is a DIY guide on how to build in the roots that support what kind of relationship you want and how long you want it to last. And be philosophical and learn when it doesn’t work out that way. Paul shows us how we can choose freely, to start and sustain a loving relationship, rather than be driven by circumstances to make choices apparently beyond our control. Read it avidly all weekend, and although not sure I understand it all and some of the mysticism is a little new to me, I thought it a very good read, with some moments of real clarity punctuating the experience. …There will I suppose be a little resistance to the mystical side of the book from traditionalists, who will (like I nearly did) categorise it as “mumbo jumbo”, but once I decided to give it a go I found it to be challenging to my pre-conceived ideas, which I like. It really was a new way of thinking for me with the inside out approach. So it could be a new way of thinking for people to find true love, life and happiness in whatever they commit to do. Outside-in: describes the love we can often have in our teen and young adult years – and perhaps later for those of us still to learn (it took me a long, long time.) The source of our love, (beauty, sexual desire, wealth, even sense of humour) starts from the outside and works its way into our hearts. This love, in the moment, can be very powerful, passionate and wonderful. The drawback with outside-in love arises because we give that power, to feel good about ourselves, to someone else. And the person to whom we give the power, to make us feel good, we also give power to withdraw it. And thus our elation and happiness can swiftly change to sadness, hurt and despair. We forfeit control of our energy force, to manifest feeling good, to someone we love. Tom and Debbie were workmates. He worked as a senior scientific manager, she an assistant in a different department. He was alone, divorced with two children grown. Tom was a naturally kind man, intelligent, good sense of humour, good looking with a penchant for falling in love quickly and deeply. Debbie was in a 6 year old relationship comfortable and secure. But Debbie was bored. She was also still at the lower end of her career ladder. She’d had several setbacks since childhood, a broken marriage, a drug problem (that Tom would not find out about for a couple of years). The first morning Tom entered the rather overcrowded hotel meeting room. Chairs in rows faced the front, a little too close for anyone to have their own space. It was going to be an intimate week, whether the course attendees liked it or not. Not paying sufficient attention, Tom first met Debbie by inadvertently brushing her right cheek with his left. He leaned a little too far forward, as he gauged the precise location of the seat behind him. At precisely the same time that Tom was sitting down, in front of him, Debbie sat down too. She did not notice him. Their heads missed. Their cheeks brushed. “Oops” 32 year old Debbie shrieked. “Oh, excuse me, I didn’t see you” apologised the 55 year old Tom. “What a lovely way to meet someone!” bubbled Debbie. Tom relaxed and became transfixed at the compliment from this vision of pony-tailed beauty. “The pleasure is mine,” came the shy, chivalrous reply. “Well how about sitting beside me then because I don’t know anyone here?” asked Debbie. Tom, blushing, was uplifted. This beautiful enchantress made him feel wonderful about himself. He was smitten already. Tom chased Debbie and tried to partner up with her on as many exercises as possible for the rest of the week, without hopefully being overly obvious in his keenness. On the final evening of the course, suitably but not overly inebriated, Tom and Debbie held hands under the table. Both excited about the possibilities to come whilst mindful that their secret was safe. Tom, feeling on the top of the world, still could not understand how someone so much younger than he would reply positively to his mild advances. Tom remained bashful. As the evening came to an end, Tom felt a small kiss was perhaps inappropriate. (Debbie did not! But it took Tom a little while to find this out.) So, fearing rejection, Tom bade his good night, retired to his own room, his chivalry and limiting beliefs about himself intact. Thereafter, Tom and Debbie found plausible reasons to meet – Tom wanted to help Debbie and agreed to mentor her. She wanted his wisdom. In the year that followed, they met regularly. There was always a short lip-to-lip kiss at the beginning and end of every encounter. As the meetings passed, the texts between the two became more frequent and amorous. Nonetheless, Tom feared to overstep the mark. He was terrified of Debbie’s rejection. Tom remained a safe distance in their meetings. Then, one afternoon, Tom declared humbly that he wished he was 20 years younger. He would have courted Debbie because she was “a wonderful and beautiful” girl. Debbie graciously accepted the compliment and agreed that she thought that they “would” have made a great couple. It was the simple word, “would”, that revealed Debbie’s innermost feeling because it was at this moment she accepted Tom’s limiting belief about himself. Time passed. When her birthday came round, she agreed to accept Tom’s invitation to a long lunch to celebrate, two days before she and her live-in partner were due to go on vacation. It was a fabulous lunch. Italian fare at its finest, in a swanky restaurant, washed down by two bottles of admirable bubbling Prosecco. As the wine helped them drop their guard Tom informed Debbie of her wonderment and his dedication to helping her further her career. An over table, still short kiss, was accepted. They descended into vaults of an old cellar, now a famous wine bar. Tom knew his Port and ordered a pipette of vintage white. Debbie impressed, held Tom’s hand over the table. Tom’s ardour grew at this first ever display of mutual pleasure in public. Debbie leant over the table and kissed Tom, for more than just a short period of time. Tom, overwhelmed, could not believe what happened to him, his mind and body consumed by passionate energy. The ensuing (and very inebriated) walk was interrupted by a stream of short, but tantalising kisses. Tom paid for Debbie’s taxi home before he skipped and tripped to the rail station. He was drunk, very drunk. He was in love (or so he thought), too much in love to sleep off his wanton drinking. He had an unsettled night. He was desperate that Debbie wouldn’t change her wanting and desire to be kissed by him, once the effect of the wines had worn off.